The fight against poverty is a long-term commitment of the member states of the European Union and an essential element of the recent European 2020 strategy. The latter, which explicitly adopts a poverty target, aims to ensure that “benefits of growth are widely shared and that people experiencing poverty and social exclusion are enabled to live in dignity and take an active part in society”. This chapter reviews how the monitoring and the analysis of poverty and exclusion have evolved over time at European level, paying particular attention to the Europe 2020 poverty and social inclusion target to which EU heads of state committed themselves in 2010. 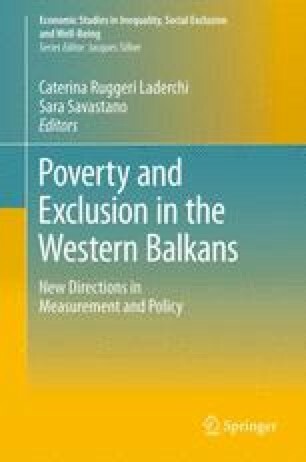 Finally, this chapter reviews the main policy lessons drawn from the EU level analysis of poverty and exclusion, as useful pointers for policy priorities also in future member states. This chapter has been drafted by a staff member of the European Commission. It does not constitute an official position of the Commission on this subject nor in any way prejudges one. Neither the Commission nor any person acting on behalf of the Commission may be held responsible for the use that may be made of the information contained in this publication. That social inclusion policies are well coordinated and involve all levels of government and relevant actors, including people experiencing poverty, that they are efficient and effective and mainstreamed into all relevant public policies, including economic, budgetary, education and training policies and structural fund (notably ESF) programmes. The extension of employment opportunities is an essential aspect of member states’ integrated strategies to prevent and reduce poverty and to promote full participation in society and economy. Appropriate use of the European Social Fund and other EU funds should be made to that end. Efforts should concentrate on ensuring equal opportunities, including access for all to high-quality, affordable and sustainable services, in particular in the social field. Public services (including online services, in line with guideline 4) play an important role in this respect. Member states should put in place effective anti-discrimination measures. Empowering people and promoting labour market participation for those furthest away from the labour market while preventing in-work poverty will help fight social exclusion. This would require enhancing social protection systems, lifelong learning and comprehensive active inclusion policies to create opportunities at different stages of people’s lives and shield them from the risk of exclusion, with special attention to women. Social protection systems, including pensions and access to health care, should be modernised and fully deployed to ensure adequate income support and services—thus providing social cohesion—whilst remaining financially sustainable and encouraging participation in society and in the labour market. Benefit systems should focus on ensuring income security during transitions and reducing poverty, in particular among groups most at risk from social exclusion, such as one-parent families, minorities including the Roma, people with disabilities, children and young people, elderly women and men, legal migrants and the homeless. Member states should also actively promote the social economy and social innovation in support of the most vulnerable. All measures should also aim at promoting gender equality.